The court granted plaintiff's motion to dismiss defendant's invalidity counterclaim for failure to state a claim. "I must apply the general guidance from [Ashcroft v. Iqbal, 556 U.S. 662 (2009)] and [Bell Atlantic Corp. v. Twombly, 550 U.S. 544 (2007)] when evaluating defendant’s counterclaim for invalidity. Defendant’s claim of invalidity provides no allegations that would suggest why plaintiff’s patent may be unenforceable. Instead, defendant relies on the bare assertion that the claims are unenforceable for one or more unspecified reasons. As I have explained in a previous case, such conclusory assertions do not satisfy Rule 8 or the standards set forth in Twombly and Iqbal." Wisconsin Technology Venture Group, LLC v. FatWallet, Inc., 3-12-cv-00326 (WIWD August 29, 2012, Order) (Crabb, J.). Following an evidentiary hearing, the ALJ found that complainant's LED patent was not invalid as indefinite. "[T]here is nothing in the intrinsic record to support [respondents'] contention that 'a spectral region consisting of ultraviolet, blue, and green' is discontinuous. . . . One of ordinary skill in the art, when reading the [patent's] specification, would understand that the inventors chose to use an abbreviated set of color names to describe the radiation spectrum ranging from ultraviolet to green, and would not find the claim term. . . to be 'insolubly ambiguous.'" Light-Emitting Diodes and Products Containing Same, 337-TA-784 (ITC August 10, 2012, Order) (Shaw, ALJ). The court approved plaintiff's motion for a protocol allowing it to engage in Wi-Fi "sniffing" at defendants' hotels, coffee shops, restaurants, supermarkets, etc., to determine what devices and configurations were being used, even though the parties disputed whether plaintiff's modified “sniffing” violated the Wiretap Act by intercepting the contents of the users' communications. "[E]ven assuming that [plaintiff's] proposed protocol intercepts Wi-Fi communications, [its] proposed protocol falls into the exception to the Wiretap Act allowing a person 'to intercept or access an electronic communication made through an electronic communication system that is configured so that such electronic communication is readily accessible to the general public.'. . . With a packet capture adapter and the software, along with a basic laptop computer, any member of the general public within range of an unencrypted Wi-Fi network can begin intercepting communications sent on that network. . . . The public’s lack of awareness of the ease with which unencrypted Wi-Fi communications can be intercepted by a third party is, however, irrelevant to a determination of whether those communications are 'readily available to the general public.'" Innovatio IP Ventures, LLC, Patent Litigation, 1-11-cv-09308 (ILND August 22, 2012, Order) (Holderman, J.). The court denied defendants' motion for summary judgment of no damages for sales that defendant argued did not infringe. "Generally put, [defendant's] position is that because its sales – whether to [a licensed third party] or of the extraterritorial variety – are non-infringing, [plaintiff] may not recover damages based on those sales. [Defendant] relies heavily on Mirror Worlds, LLC v. Apple, Inc., 784 F.Supp.2d 703 (E.D. Tex. 2011) . . . The Court does not read Mirror Worlds as [defendant] would have it. . . . First, such a restrictive reading is contradictory to Federal Circuit precedent, which does not require a reasonable royalty to be tied only to use of the patented method (i.e., infringement). Further, one of the simplest ways to determine the value of an infringing use of a patented method during research is to ascertain how many sales were made based on that infringing use. . . . Second,. . . [defendant] has also conceded that its infringing use is the but-for cause of [its] sales. Thus, [plaintiff] has demonstrated that [defendant] infringes [its] Patents and that infringement is directly related to [defendant's] sales. This evidence was lacking in the Mirror Worlds case." Carnegie Mellon University v. Marvell Technology Group, Ltd., et. al., 2-09-cv-00290 (PAWD August 24, 2012, Order) (Fischer, J.). Samsung infringed six Apple patents (three utility, three design). Apple’s patents were not invalid. In most cases, Samsung’s infringement was willful. Samsung found liable for trade dress infringement but not for breach of contract or antitrust claims. None of Samsung’s five patents were invalid, but two were unenforceable due to exhaustion. Hearing on permanent injunction is currently set for September 20, 2012 but is subject to change. Apple Inc. v. Samsung Electronics Co. Ltd., et. al., 5-11-cv-01846 (CAND August 24, 2012, Verdict). The court denied defendant's motion to dismiss plaintiff's declaratory relief action for lack of subject matter jurisdiction because of defendant's statements on its website and history of aggressively enforcing the patent-in-suit. "[Defendant's] patent enforcement record before [plaintiff's] declaratory filing date contributed to the creation of a justiciable controversy. Its record after the filing date confirms its continued existence. . . . Both before and after [defendant] warned [plaintiff] and its customers on its website, [plaintiff] watched [defendant embark on a sue-settle-warn-repeat cycle." General Electric Company v. NeuroGrafix, et. al., 2-12-cv-04586 (CACD August 16, 2012, Order) (Pfaelzer, J.). The court granted defendants' motion for relief from the magistrate judge's order denying as untimely defendant's motion for a mirror spoliation adverse inference instruction against plaintiff. However, the court granted the parties' request to forego identical adverse instructions against both sides. "To this Court’s knowledge, under Federal Rule of Civil Procedure 51(a)(1), a party’s request for a jury instruction is timely if made '[a]t the close of the evidence or at any earlier reasonable time that the court orders.' Thus, [defendants'] motion appears to be timely. . . . By failing to do as little as issue a litigation hold notice to any employees for eight months after its preservation duty arose, and by further delaying issuance of litigation hold notices to several key custodians, the Court finds that [plaintiff] acted with not just simple negligence but rather conscious disregard of its duty to preserve. . . . Accordingly, in light of the foregoing, the Court grants [defendant’s] motion for a mirror adverse inference instruction against [plaintiff]. . . . However, the parties indicated at the . . . hearing that if the Court decided to issue identical adverse inference instructions against both parties, they prefer that neither adverse inference instruction be given. Accordingly, the Court will not give either jury instruction." Apple Inc. v. Samsung Electronics Co. Ltd., et. al., 5-11-cv-01846 (CAND August 21, 2012, Order) (Koh, J.). The court granted defendants' early summary judgment motion and found that plaintiff's transaction entry system patent was invalid for failing to claim patentable subject matter. "[T]he court finds that the abstract nature of plaintiff's patent is plainly apparent. The patent, broken down into its component parts, recites steps by which data is obtained, sorted and stored. These steps represent nothing more than a disembodied concept of data sorting and storage and, therefore, the court finds the abstract nature of this patented process to be manifestly apparent. . . . [T]he use of a telephone to capture data does not make the abstract concepts of sorting and storing data somehow patent-eligible. To the extent that a machine is also involved in the sorting or organizing step (step two), that . . . machine is just a general purpose computing device being asked to do some unspecified sorting function. Claiming a generic 'computer-aided' sorting process is insufficient under the machine prong of the [machine-or-transformation test]. Essentially plaintiff has claimed nothing more than the idea of sorting via machine." CyberFone Systems LLC v. Cellco Partnership, et. al., 1-11-cv-00827 (DED August 16, 2012, Order) (Robinson, J.). The court granted defendant's motion in limine to exclude references to the presumption of patent validity, a prior administrative determination of patentability, and defendant's rejected reexamination request. "The court will explain the burden of proof on invalidity. The reexamination results are not relevant evidence." Smith & Nephew, Inc. v. Interlace Medical, Inc., 1-10-cv-10951 (MAD August 17, 2012, Order) (Zobel, J.). The court granted plaintiff's motion for treble enhanced damages after the jury found willful infringement and the court found that all nine Read Corp. v. Portec, Inc., 970 F.2d 816 (Fed. Cir. 1992), factors favored such an award. 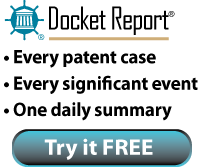 "[E]ven after being sued in this case, [defendant] waited approximately seven months to determine if its products infringed the [patent-in-suit]. After learning that is products did infringe the [patent], [defendant] made an 'infinitesimal' change in an apparent attempt to stop future infringement. There was no evidence how [defendant] concluded this change was sufficient to prevent future infringement and, in fact, it was unclear whether the change was even made to all of [its] systems. . . . [Defendant] learned it was infringing in 2007 but did not disclose that until 2011. Between 2007 and 2011, [it] vigorously argued that no evidence existed which would establish infringement. Moreover, [defendant] did not alert its customers to the alleged changes in its systems meant to prevent future infringement and there were no meaningful changes to its system manuals reflecting that the operations had been altered." Integrated Technology Corporation v. Rudolph Technologies, Inc., et al., 2-06-cv-02182 (AZD July 23, 2012, Order) (Silver, J.). On remand, the court reversed its pre-Therasense finding of inequitable conduct and determined that plaintiff's database patent was not unenforceable under Therasense v. Becton, Dickinson & Co., 649 F.3d 1276 (Fed. Cir. 2011) where plaintiff identified a prior art system in its IDS but did not produce a brochure regarding that system to the PTO. "The [prior art] System that is the subject of the [undisclosed] Brochure represents a significant body of programming effort that, under Federal Circuit standards, could not be enabled by a mere bullet-point brochure. . . . Since the [brochure] lacked enablement, it could not have stopped the PTO from granting the [patent-in-suit's] claims had it been disclosed. Accordingly, under the appropriate Therasense 'but-for' test, the [brochure] is not material, and [defendant's] inequitable conduct defense fails." Golden Hour Data Systems, Inc. v. emsCharts, Inc., et. al., 2-06-cv-00381 (TXED August 15, 2012, Order) (Gilstrap, J.). The court overruled defendant's objections to the court's scheduling order, which required appointment of a "lead defendant for briefing and argument" of claim construction, and rejected defendant's claim that the order violated due process. "[Defendant] claims it is improper to require an unrelated defendant to argue claim construction on [its] behalf. . . . The Court’s procedure mimics the accepted procedure of assigning lead parties in complex cases, such as in multidistrict litigation and class action suits. . . . The lead defendant in effect acts as the liaison for all the defendants during the Markman procedure. Although the lead defendant is the responsible party, it serves in a representative capacity on behalf of all defendants for common issues. Accordingly, the Court is unpersuaded that its procedure deprives [defendant] of any constitutional right." GeoTag Inc. v. Circle K Stores, Inc., 2-11-cv-00405 (TXED August 14, 2012, Order) (Schneider, J.). Multi-Defendant Case Severed Per AIA (§ 299), But Consolidated for Pre-Trial With Venue Issues Delayed Until After Claim Construction. After granting defendants' motion to sever and consolidating the cases for pre-trial purposes, the court issued an order retaining all cases through the claim construction phase, even if pending motions to transfer were or would be granted. "This serves two important purposes. First, it conserves judicial resources by requiring only one district court to address the underlying disputed claim terms. . . . Second, this case management approach ensures that the related patent cases proceed initially on a consistent claim construction, thus avoiding inconsistent rulings. However, this case management approach should not be perceived as an invitation to file motions to transfer venue. . . . This Court currently has approximately forty pending motions to transfer venue. If the average cost of discovery and briefing for each of these transfer motions is only $300,000, then approximately $12 million is being spent by the parties on an issue that does not move the ball down the field, but only seeks a new field upon which to play." Norman IP Holdings, LLC v. Lexmark International, Inc., et. al., 6-11-cv-00495 (TXED August 10, 2012, Order) (Davis, J.). The court granted defendant's motion for attorneys' fees under 35 U.S.C. § 285 following the dismissal of plaintiff's second amended complaint. "Regarding pre-filing investigation, Plaintiff concedes in opposition to the Motion for Sanctions that 'Plaintiff has not alleged that Defendant provides user input devices because such information is not available publicly so there is no basis to make such a statement as to that specific fact.' Plaintiff therefore acknowledges that there was no good faith basis to assert this claim against Defendant and that the lawsuit was filed with the knowledge that Plaintiff could not allege a required part of the patent claims. Thus, the litigation was objectively baseless. . . . Nevertheless, Plaintiff continued to prosecute this case, resulting in briefing on two separate Motions to Dismiss and a frivolous Motion for Reconsideration." Lyda v. Fremantlemedia North America, 1-10-cv-04773 (NYSD August 9, 2012, Order) (Batts, J.). The court denied defendants' post-trial motion for judgment as a matter of law that the accused online shopping cart system did not infringe plaintiff's internet commerce patents. The court rejected defendant's divided infringement argument that the patented system required two computers and defendants' only put into service one such computer. "Defendants argue that they. . . do not use the claimed system because the claims require a buyer computer (client-side) and a shopping cart computer (server-side). . . . Here, unlike [Centillion Data Systems, LLC v. Qwest Communications International, Inc., 631 F.3d 1279 (Fed. Cir. 2011)], Defendants do not require their customers to download and install software so that the buyer computer is able to interact with the shopping cart computer as required by the claims. Rather, the delivery of Defendants’ web page itself provides the programming required by the claims; the user is not required to install anything. Thus, Defendants’ web server, by delivering web pages containing embedded programming, puts the system as a whole into service so that Defendants may benefit from the system. Accordingly, Defendants use the system under § 271(a) by putting the system into service, i.e., controlling the system as a whole and deriving benefit from it." Soverain Software LLC v. J.C. Penney Corporation, Inc., et. al., 6-09-cv-00274 (TXED August 9, 2012, Order) (Davis, J.). The court granted in part plaintiff's motion for sanctions after defendant halted the deposition of its engineering manager and allowed defendant to choose either (1) monetary sanctions with a new deposition of the witness and a waiver of privilege as to any post-initial deposition conversations about the patents-at-issue, or (2) precluding the witness from trial with an adverse inference instruction to the jury. "If the Court simply imposes fees and expenses and orders completion of [the] deposition, it would be a nominal sanction at best, as [defendant] would have accomplished what it conceivably wanted – disruption of the deposition and an opportunity to visit with the witness regarding his testimony. . . . [T]o give an adverse inference instruction, as requested by [plaintiff], is to conclude that [defendant] did in fact terminate the deposition to give it an opportunity to coach the witness and that the testimony would have been unfavorable to [defendant]. While there is a strong inference that this is indeed the case, the Court is hesitant to make such a definitive finding. . . . This choice of sanctions allows [defendant] to complete the deposition and avoid the adverse inference instruction, but prohibits it from potentially profiting from having stopped the deposition. At the same time, if [defendant] chooses not to complete the deposition with any otherwise privileged post-termination communications waived, then such an adverse inference instruction is justified and appropriate." VirnetX Inc. v. Cisco Systems, Inc., et. al., 6-10-cv-00417 (TXED August 8, 2012, Order) (Davis, J.). Joao Control and Monitoring Systems of California LLC v. Sling Media, Inc., et. al., 3-11-cv-06277 (CAND August 7, 2012, Order) (Chen, J.). The court granted plaintiff's motion to compel the production of defendant's outbound licenses and cross-licenses in connection with the accused technology. "District court decisions in this Circuit both before and after [Lucent Technologies, Inc. v. Gateway, Inc., 580 F.3d 1301 (Fed. Cir. 2009)] and [ResQNet v. Lansa, Inc., 594 F.3d 860 (Fed. Cir. 2010)] have considered cross-licenses relevant for discovery purposes, noting the different legal standards for discoverability and admissibility. Thus, [defendant's] assertion that cross-license and outbound agreements involve different technologies and markedly different structures from the hypothetical license relevant here does not preclude discovery even if those agreements are inadmissible at trial." Richard A. Williamson v. Citrix Online LLC, et. al., 2-11-cv-02409 (CACD August 3, 2012, Order) (McDermott, M.J.). The MDL panel denied plaintiff's motion to transfer six actions involving its genetic testing patent to the MDL based in part on plaintiff's litigation and licensing history. "The patent’s litigation history suggests that most actions that have been filed in the past several years have not required significant judicial attention. [Plaintiff] has filed at least nine actions over the course of the past nine years against at least 24 defendants, and only one case has proceeded to claim construction. Recently, an action filed in the Western District of Texas against seven defendants was resolved in a little over a year. . . . Further, [plaintiff] has a fairly extensive licensing history, reportedly issuing licenses for the technology to over 60 entities." Genetic Technologies Limited v. Bristol-Myers Squibb Company, 1-12-cv-00394 (DED August 3, 2012, Order) (MDL Panel). ArCzar, LLC v. Navico, Inc., 4-11-cv-00805 (OKND August 2, 2012, Order) (Eagan, J.). The court granted plaintiff's motion for summary judgment of no infringement under the doctrine of equivalents of defendant's tuner patent. Prosecution history estoppel precluded application of the doctrine of equivalents even though the inventor prosecuted his application pro se and, defendant argued, did not understand the effect of his amendments. "The horizontal and vertical range limitations were originally included as dependent claims; in response to prior art objections, [the inventor] added a new revised independent claim that included those limitations, and cancelled the broader independent claim he had originally proposed. . . . [Defendant] cites no authority for the proposition that a patentee acting pro se can escape estoppel where others could not, and the court declines to adopt such a broad rule in the absence of controlling precedent." Maury Microwave, Inc. v. Focus Microwaves, Inc., 2-10-cv-03902 (CACD July 30, 2012, Order) (Morrow, J.). The court denied defendant's motion for attorneys' fees under 35 U.S.C. § 285 following summary judgment and rejected defendant's argument that the litigation was unjustified. "[Defendant] argues that bad faith is apparent based on the pattern of suits against many defendants followed by settlement demands that were below the cost of a typical defense. . . . The fact that the patent has been enforced against several other entities that settled does not place this in . . .[the] realm of the behavior [addressed in Eon-Net LP v. Flagstar Bancorp, 653 F.3d 1314, 1327 (Fed. Cir. 2011)]. The court there found that it was not bad faith for a patentee to 'vigorously enforce its patent rights or offer standard licensing terms.' However, in light of already finding that the claim construction position taken by the patentee was objectively baseless, the court found that by offering to settle for orders of magnitude less than litigation defense costs, bad faith could be inferred. Here the disparity between the settlement offer and fees being sought is smaller, and the Court is not presented with the same extensive alternate grounds to find the case exceptional. Perhaps, in light of an extremely objectively baseless position, these facts could support bad faith under Eon-Net. However, as detailed below, the Court finds the position was not objectively baseless." Network Signatures Inc. v. State Farm Mutual Automobile Insurance Company, 8-11-cv-00982 (CACD July 30, 2012, Order) (Selna, J.). The court granted in part defendant's motion for summary judgment of noninfringement of plaintiff's encryption patent where an accused encryption protocol only theoretically infringed. "[E]ven if the Plaintiff could produce evidence to demonstrate that TKIP, in certain random implementations, would result in blocks of uniform equal length, that capability alone would not be sufficient for a finding of infringement, at least as to the methods claims. . . . [T]he question is whether [defendant] can be held liable because [its encryption protocol] may hypothetically result in identical length blocks, although the Plaintiff has been unable to demonstrate at this stage of the litigation that real-world implementations of the protocol can infringe. . . . [Defendant] has not provided evidence that [its encryption ] is incapable of resulting in equal block length, only that it is 'theoretical' and presumably, highly unlikely. Nevertheless, the Defendant has shown that the evidence fails to establish a material issue of fact essential to the patentee’s case. . . . This is not to say that in every instance of patent infringement, the patentee must necessarily demonstrate specific instances of infringement. What the Court finds here is that [plaintiff] has failed to even satisfy the minimal burden that [defendant's encryption] is in reality capable of meeting the 'blocks' limitation. Thus, [plaintiff] has failed to establish a genuine issue of material fact regarding literal infringement with regard to [defendant's encryption]." Paone v. Microsoft Corporation, 2-07-cv-02973 (NYED July 30, 2012, Order) (Spatt, J. ).